Your business deserves the best commercial heating service North Shore offers. 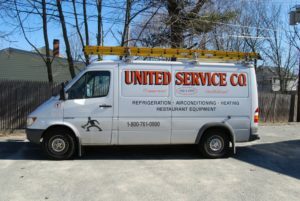 Come to United Service Co. for dedicated, high-quality HVAC services. Since 1953, our business has served the local market with premier heating and air services. We install, maintain, and replace systems so our customers can enjoy uninterrupted heating and cooling experiences throughout the year. Whether you’re a new business owner or a seasoned veteran, we help you navigate the complexities of commercial heating and air services. Find the right solution for your business today. Here in the Northeast, you may see several companies marketing commercial HVAC work. While many companies offer the work, few provide the honest and cost-effective results you expect from a professional service company. Our commercial heating service in North Shore has been around for more than six decades. We understand the value of business credibility and loyalty. Trust our licensed, trained, and EPA-approved technicians to offer the latest insights into heating and air services. Our team offers free equipment inspects and estimates for your peace of mind. When we respond to a customer call, we’ll send a professional, GPS-guided technician to your property for a personalized visit. We pride ourselves on offering prompt and satisfactory services for emergency repairs, installations, and maintenance for HVAC systems. Our commercial heating service in North Shore guarantees customer satisfaction. If you’re not 100% happy with the results of our work, let us know. We want to earn your business today and into the future. As a one-stop shop, we do more than basic commercial HVAC work. We can service units up to 50 tons, heat pumps, ventilation hoods, mini-split systems, exhaust fans, and more in commercial and industrial environments. In addition to our HVAC work, we offer comprehensive refrigeration services, refrigerator design and build services, and restaurant equipment services. Before you settle for a commercial heating service in North Shore, consider the experience and capabilities of each business. We know you’ll appreciate our commitment to the trade and reputation for excellence. Look at our customer testimonials and see why others prefer United Service Co.
At United Service Co., our technicians are licensed, trained, and factory authorized. They undergo intense training onsite and receive constant feedback on the job. As a service-based business, we recognize the importance of customer service on every call for commercial heating in North Shore. Collectively, our team brings more than 100 years of experience to the table. We are state licensed, and we undergo ongoing industry training requirements to maintain our level of expertise. If you’re searching for experts in commercial heating and air, come to our family owned and operated business. We commonly work with restaurants, schools, hospitals, hotels, supermarkets, and other commercial facilities. If you’re optimizing an industrial HVAC and ventilation system or working on a small-scale mom-and-pop shop, our team can help. No job is too large or small for our dedicated technicians. Reach out to us for around-the-clock emergencies, new installations, preventative maintenance, and repairs. We know you’ll appreciate our commitment to your commercial heating service. North Shore facility managers can dial (800) 761-0900 or (978) 750-5600 to reach our team.